Squirrels may appear cut and cuddly and fun to look at, but when it comes to feeding their appetite seems to be endless. 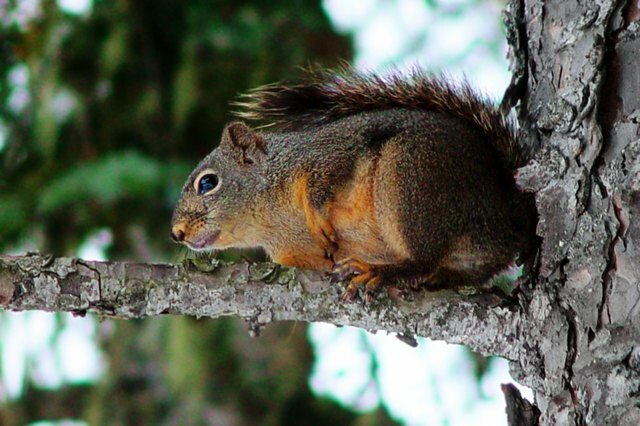 If you would like to feed your backyard squirrels, you can save some money on food by making your own. One of a squirrel's favorite treats is a corn cob. Pick up some plain corn cobs at the grocery store and dry them for the squirrels. This process can take some time, so you may want to do several at once. Remove the corn husk and corn silk from the corn, and then break off the stalk end. Preheat your oven to 150 degrees. While the oven is heating up, bring a pot of water to boil. 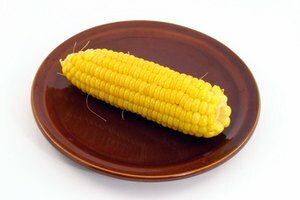 Once the corn is husked, boil each ear for 2 minutes, and then, using tongs, remove it from the boiling water and place it in the bowl of cold water for 4 minutes. Remove the corn from cold water and put it on a baking sheet, spacing the ears so they are not touching each other so the air can circulate around them. Put in the oven for 8 hours at 150 degrees. Using the tongs, flip the corn every 2 hours during cooking. When the 8 hours is nearly up, test the corn by pressing down on the kernels. If they feel brittle, remove the corn from the oven. Let the corn air dry for 3 days. If you have any problems with rodents in your house, you may need to hang them to let them air dry. 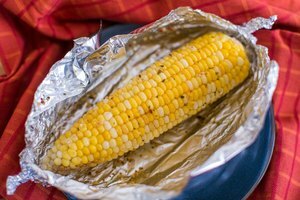 Store the corn in a paper bag, and then inside a sealed container where rodents and squirrels can't get to it until you are ready to feed them. You can place more than 1 tray of corn in the oven at a time if you wish, but rotate the tray shelves every 2 hours when you turn the corn. Take the tray that is on the bottom and place it on the top rack, and vice versa. Do not raise the oven temperature to try and dry the corn faster. 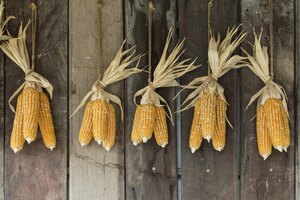 If you do, you may dry the kernels quickly but the cob may stay moist which can lead to rot.